One of the many violet color variations. Once again I find myself on my local rail-trail. I am trying to get my heart-rate up so this meander will count as some form of exercise, but I keep stopping to look very closely at tiny little wildflowers blooming everywhere. It is truly like I stepped into a jewelry box. Virginia Bluebells coat the hillside in blues and pinks. White saxifrage, rue anemone and Dutchman’s britches dot the trailsides like scattered pearls. Various shades of jade and emerald are starting to appear on gray branches. The creek along the trail, very high after all these rains, slithers through the color like a gold chain. I should just go to a boring track, who can focus on fitness with all this beauty around? Each time I squat down to investigate, that’s a rep…right? Today I am enamored by the violet. If I am going to take the jewelry box analogy just a little too far…these are the amethysts. Categories: Native Plants | Tags: Bowman's Hill Wildflower Preserve, Edible Flowers, groundcover, native plants, Perkiomen Trail, Public Gardens, public service announcement, rare plants, Seed Dispersal, spring, Viola, violet | Permalink. Some of the most fascinating things you learn by accident. That is how I became aware of the forces of the Witch Hazel. I was taking a botanical illustration class at the Morris Arboretum of the University of Pennsylvania and had an assignment to collect some botanical materials to draw in the next class. Being fall, I collected crunchy leaves, seed pods and acorns. I placed everything in a small cardboard box on top of the TV where they would stay, and I wouldn’t lose them, until next class. A couple evenings later I am settling in for the night, curled up in a chair watching what my dad calls “the idiot box”. During a lull in the program I hear a noise. A faint tap. What in the world? 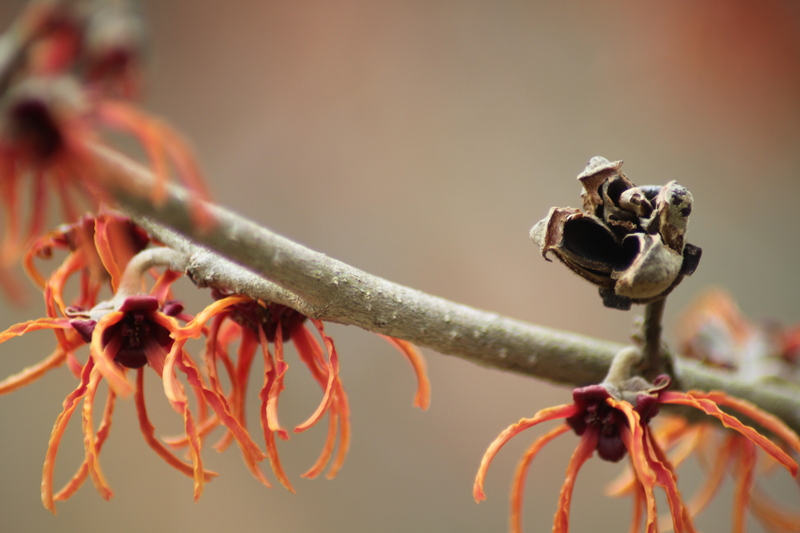 Categories: Native Plants, Plants on the Move | Tags: Morris Arboretum, Public Gardens, Seed Dispersal, Witch Hazel | Permalink.